Saatchi Art’s curators have worked with artists from around the world to hand-pick every artwork we offer on Limited in order to provide you with an unmatched selection of limited edition prints. We are proud to offer "Autumn Rain Moves Over #3" by xuan khanh nguyen, which is available exclusively on Limited. Artworks in a limited edition have a set number of prints available for each size offered. For the 8x12 size edition, "Autumn Rain Moves Over #3" comes in a limited edition of only 100 prints. Once all 100 of the prints in this edition size have sold out, there will be no other prints of "Autumn Rain Moves Over #3" available in the size of 8 inches high by 12 inches wide. Limited edition prints of this artwork may be available in other sizes. The painting describes a group of school girls in white “Ao dai” (the traditional long dress of Vietnamese woman) In my opinion, Fine arts is the way connected to spiritual cosmos and realistic life. 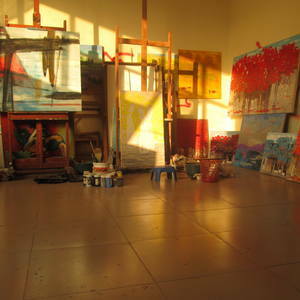 It always reflects the consciousness world of an artist on the surface of canvas via colors, shapes, lining figures, etc. My art is picking-up from the real life with far-away dreams of a pure universe embedded in everybody's memory... With main purpose of only using a few colors, minimum concised lay-out and characters in order to express the maximum expressiveness and create one new view about realistic world..